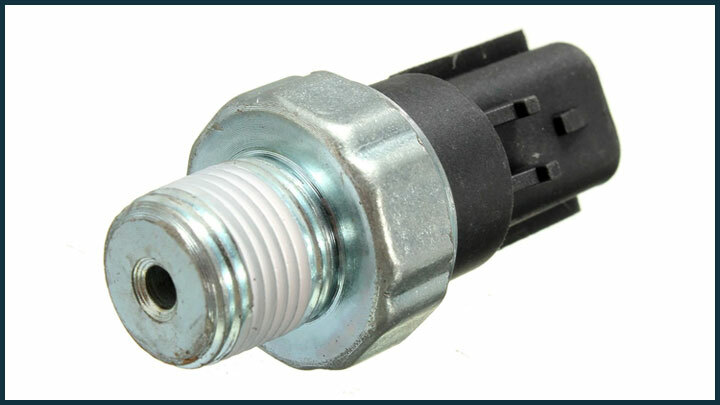 Here we’re going to discuss the following engine sensor: The oil pressure sensor (or oil pressure switch). I will be explaining what the functions of this sensor are and what symptoms may occur if this sensor malfunctions. What Happens if the Oil Pressure Sensor is Good? The main job of an engine oil pressure sensor is to keep track of the oil pressure in the vehicle and then transmit this information straight to the combination meter or the instrument panel. If the vehicle has an electronic control module, then the oil pressure switch will send this information to the module where it can be calculated. After it is calculated, the information gets sent to the combination meter or instrument panel so that the engine oil pressure warning light or the oil pressure gauge can be activated. Sometimes if the oil pressure sensor is not working properly, there will be blinking from the low oil light on the dashboard. This could cause a driver to panic because they’ll believe that their oil levels are low, which would end up damaging the engine if it were true. In order to determine if this is a real warning or not, you should manually check your oil level to see if it is low. If it isn’t, then it is likely you have a faulty oil pressure sensor and you need to replace it right away. If you are driving an older vehicle, then it likely has a mechanical gauge that calculates the oil pressure. Whenever the oil levels are normal but the gauge is showing zero, this means the oil pressure sensor needs to be replaced because it is faulty or there is some type of connection issue. If you are driving a modern vehicle, then your oil pressure gauge is probably electronic and transmits an electronic signal to get the reading. Whenever an oil pressure sensor is not working properly in a modern car, it will cause the gauge to have strange readings or it will sit on full or zero. Check the wiring to the sensor and replace as needed. The best way to test if your sensor is bad is through the lights on the oil pressure gauge. If the light for “Low Oil” comes on when they engine’s oil levels are normal, then you likely have a bad oil pressure sensor. Anytime this sensor is defective, it will give you false readings. Eventually, these readings will go away beyond the normal specifications which will cause the warning light to turn on. At this point, you should replace your sensor right away in order to stay properly informed on your oil levels. Thanks for the good job that you are doing. I have a Toyota Belta. And it problem is oil pump which was not pumping oil propely to the engine. I bought a new oil pump. The problem which am still having is the same problem, new oil pump doesnt pump oil to the engine again. Kindly assist me what is the problem and can it be fix? how you know the brand new pump not working? are you see oil warning pressure light comes on, or engine knocking noise when engine run after replacing new pump? The problem came up when i did the service and put synthetic oil. I did replace the oil with the shell yellow can oil but the problem is still there. What could be the issue? Well you covered alot but, 03 avalanche I have replaced the unit 4 times , in a year do to having a high reading of 80+ psi pegged out. , I usely use a mix blend .but I have noticed when I add a conventional to keep it full some where around 1 qrt before oil change it does it , it Peg’s out to 80 , grand it IAM getting better at changing it it’s in the back where the distributor was. Not I still get pissy ,, any suggestions of what may be causing this. Hi, I have a 2015 dodge caravan the check engine light turned on had a reading and it shows I need to replace the oil sensor switch, but my oil light has not come on. Is that common? The low oil pressure light should be directly controlled by the oil pressure sensor so in theory it should come on if the sensor is bad. It’s possible it’s a false positive. If your oil level looks good and you don’t notice any oddities while driving, you could clear the code and see if it comes back. This may not apply to your vehicle, but the bulb behind the oil pressure light should still be good but if you bought the vehicle used, there’s a chance the previous owner removed the bulb to hide a problem.